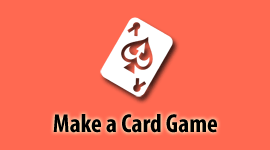 How do I make my own board game or card game? 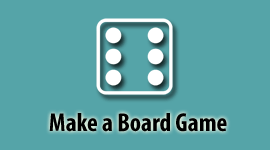 Click on a tutorial video below to learn how to make a custom board game or card game. Create a new user account on our website and sign in, or login to your existing account. You must also have a graphic design program installed. Note: This is true even if the game is only intended for personal use. For more information, please see our intellectual property policy. The first step is to browse our product catalog and decide which items will work for your game. In the product catalog, click on the items you want in your game. Download the template for each product and save it to your computer or device. Open template files in your graphic design program and create a new layer to add your artwork. Verify that important parts of the image are in the blue-dotted safe zone and that the background color/pattern exceeds the red cut line and fills the entire gray bleed zone. Warning: Step 3 is where people often make mistakes! New users often make mistakes when designing artwork because they don't read all of our help documentation. Avoid wasting time and money by making sure you read our documentation and design your game correctly in our system. We do not offer reprints for issues caused by user error. If you have questions, please contact us. We're glad to help! Note: Files must be exported in RGB color file format. Click Make Games from the main menu and then My Games. Then click the Create A Custom Game button. First, click on the Edit Details button under the Management section and scroll down to the "Name" field in the Basics section. Hit enter to save. Return to your new game project by clicking on the game name at the top of the screen. Click the Edit button for the component you want to add. Then click Edit for the type of component. Upload the images for this component using the green box. Note: Files must be less than 100MB. Upload 25 files or less at one time. Once you've uploaded your images, you'll be able to change the quantity of each component. We will only send you the quantity that you list for each component and not a full sheet. Note: If a component only has a quantity of 1, that means we will ship you 1 copy of that image/component (chit, card, etc...) and not a full sheet of that image/component. Any unused blank components from a sheet will not be sent. All images that are uploaded to The Game Crafter must be proofed. Unproofed images will have an orange box with an "i" above them. To proof an image, click on the gray button with an eye symbol and ensure that your image follows the template overlay. By clicking on the green approve button, you are acknowledging that you are satisfied with the image and it is ready for printing. After you click approve you will be taken to the next unproofed image for that component type. Click on the Add to Cart button under the Management section. Then it will be added to your cart. Click on the Cart button on the top menu. Note: To do this from the home page, click Make Games from the main menu and then My Games. Click the Edit button for the game and then click the Add to Cart button. Note: After you receive your first copy, please be sure to review all of the components in your game for any changes or corrections that need to be made before ordering additional copies of your game. - Send us a message on Facebook or Twitter. Note: To keep our overhead costs and product prices low, we do not provide phone support. Instead we provide excellent online support! After ordering a copy of your game, you'll have to wait 10 days before you are allowed to publish your game. This policy ensures that designers have time to receive the physical game and review it before they hit publish. Once the game is published, your game will be available for purchase!